These turkey desserts are so much fun! If you’re looking for some really festive treats to make for a Thanksgiving get together, or just to celebrate, we have a bunch! My kids love getting in the kitchen and making desserts and we plan to have a lot of fun with some of these. Love these Oreo and Reece’s turkeys! If you love Oreo’s like I do, you’ll love making these Oreo + pretzel turkeys. From The Krazy Koupon Lady. These turkey rice krispie treats will be a huge hit with the kids on Thanksgiving! From Shugary Sweets. Make turkey snack bags with goldfish crackers and popcorn. These are so much fun. From That’s What Che Said. These turkey pretzel wands are adorable. From Frugal Coupon Living. Try a healthier snack with these turkey apples! From Cute As A Fox. Use Oreo’s as eyes on these adorable turkey cupcakes. Love it! From Kelly Stillwell. Make a large apple turkey with a marshmallow head and cheerio feathers! From Mommy’s Kitchen. Use pretzel chips to make this yummy turkey treat. From Worth Pinning. Make turkey ice cream! This one just might be my favorite. From Hungry Happenings. A fruit roll up and a nutter butter cookie combined make the perfect turkey snack. From Betty Crocker. A Reese’s cup makes the perfect turkey treat that everyone will love. From Bitz n Giggles. Make a turkey pudding cup – this one is super easy! From Party Pinching. This Thanksgiving turkey treat made out of pretzels and Oreo Thins are adorable and yummy. From The Idea Room. The chevron pattern on these turkey sugar cookies is so cool. From The Bearfoot Baker. These chocolate rice krispie treat turkey balls are so good! From I Dig Pinterest. 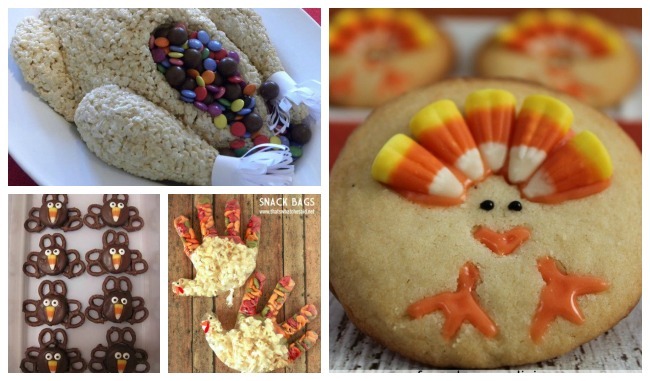 Easily dress up your favorite sugar cookie to look like a turkey. From Frugal Coupon Living. Fill a small mesh bag with Reese’s pieces and add pipe cleaners to make a turkey head and legs! Follow these directions on Clean and Scentsible. Make a large cupcake platter shaped like a turkey. Perfect for a party! From Stylish Eve. Oreo cookie balls are the best thing ever. 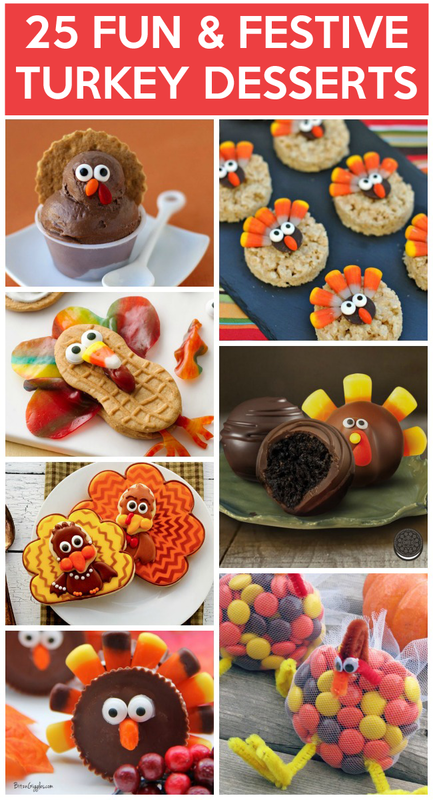 Add a few pieces of candy to make it look like a turkey! From Snack Works. Take an ordinary snack cup, flip it upside down and add feathers for a festive turkey snack. From The Keeper of The Cheerios. Make a full size turkey out of rice krispie treats and fill it with candy. This one is pretty impressive! From Hometalk. Test your sugar cookie skills with these advanced turkey sugar cookies. Your Thanksgiving guests will adore these! From Sweetopia. Try these mini chocolate cheesecakes that — you guessed it — look like turkeys! From Hungry Happenings. I love this fruit turkey. Use pears and grapes to make this. From Coffee Cups and Crayons. 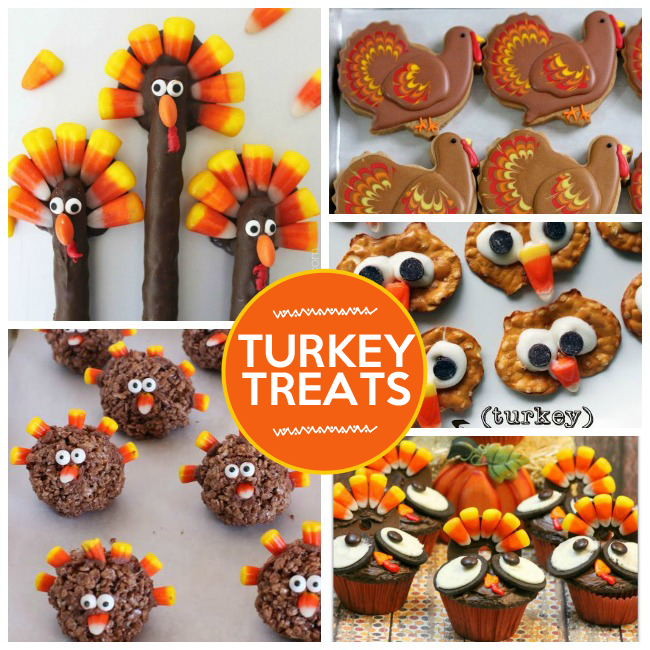 Use vanilla Oreo’s to make these fun turkey treats. From La Jolla Mom. Check these Thanksgiving Food Ideas that will keep your family eating well over the holiday!